Healthy living has a different definition to different people. To me, healthy living means living my life in a way where I feel my best. For me, this includes eating right (usually), exercising, drinking water and (trying) to get enough sleep. 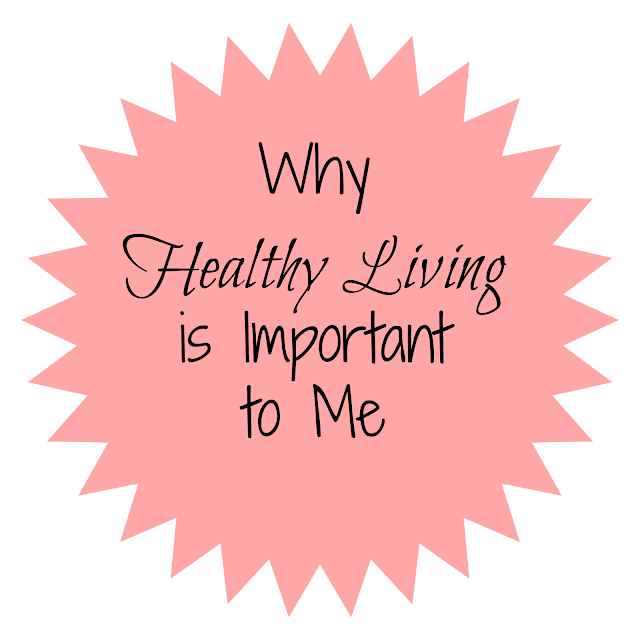 Healthy living is one of my favorite topics to discuss. As a registered dietitian, I am always talking about food, fitness and how to be healthy. I could talk about these topics all day (and do!). There are so many different reasons why healthy living is important to me which I want to share with all of you! 1. To feel my best physically- When I eat right, exercise and sleep well, I feel my best. When I do not do these things, I definitely feel the difference. I do not believe that you have to eat healthy 100% of the time. I believe more in an 80/20 rule where you eat well about 80% of the time and the other 20%, you can have some indulgences. For example, have that pizza and beer out to dinner but the next morning, get up and go for a run and have veggie eggs for breakfast. Healthy living is all about balance. When I live healthily, I feel stronger, more energetic and can be the best mom, employee and wife that I want to be. 2. To feel my best mentally- Let me tell you, when I do not live healthily, my mental health suffers. When I am dehydrated, I feel myself being more irritable. Therefore, it is very important to me to drink enough water- ask my husband, he has seen the Wrath of Amanda ; ). Also, when I am short on sleep, it is easy to be lazy, be more irritable and I am not the best person that I want to be. No matter how dorky it may be, I try to make sure that I get enough sleep so that I feel good (baby does not always agree with me on the importance of good sleep!). 3. To be healthy for my daughter- My daughter is 9 months old now and is getting more and more active. She is taking steps, crawling everywhere and pulling herself up. In no time, she will be running all around, climbing up the stairs and more. Therefore, I want to be in great health so that I can run along with her. I don't want to be lagging behind! Also, she is getting heavier so I lift weights so that I can carry her without issue. I want to live to be 100+ and want to be healthy all along the way! 4. To prevent disease- Not only do I want to live a long life but I want to live a healthy life. I work in a nursing home and see all kinds of situations of young people who are not healthy. I want to do everything that I can to prevent disease. How I do this is by not eating too much salt and fat and by exercising regularly. Of course genetics plays a role in disease but so does lifestyle. 5. To prevent obesity- According to the Centers for Disease Control and Prevention, 1/3 of U.S. adults are obese and 17% of children are obese. This is associated with many health risks including heart disease, hypertension, type 2 diabetes, osteoporosis and some types of cancer. By eating right, you can help reduce your risk. Focus on antioxidant rich fruits and vegetables and whole grains. Limit saturated fats, eliminate trans-fats and keep cholesterol intake within recommended limits. Reduce added sugars and refined grains. I am to get some form of exercise in everyday. This can include simple exercises such as walking or some jumping jacks and squats. Along with eating right, drinking lots of water, exercising and getting enough sleep, I also take a couple of supplements. I take a multivitamin, sometimes omega-3 (if I did not eat enough in my diet that day) and probiotics. I recently tried Align Probiotics. Probiotics can be beneficial to restore the healthy bacteria in your body and improve digestion. Align Probiotics helps maintain your digestive system’s natural balance*. I like taking a probiotic when I am sick especially and when I am having any digestive issues. These can be purchased at Target. When you buy 2 Align probiotic products, you can get a $5 Target gift card now through 7/4. If you use the Cartwheel app (I love this! ), you can get 15% off through 7/19. *This statement has not been evaluated by the Food and Drug Administration. This product is not intended to diagnose, trea, cure, or prevent any disease.